The Republic of Peru is a country on the West of the South American continent and the third largest of the sub-continent (1,285,220 square Km). At the July 2008 census its population stood at 29.1 million inhabitants. The population of the capital Lima, the largest city, is 9 million. Puerto Maldonado is located 55 km to the West of the Bolivian border where the rivers of Tambopata and Madre de Dios and tributary of the Beni and thus part of the Amazon basin. Puerto Maldonado is located in the South western part of the Peruvian jungle at about 650 feet above sea level with 140,000 inhabitants with the highest demographic pressure of the country. 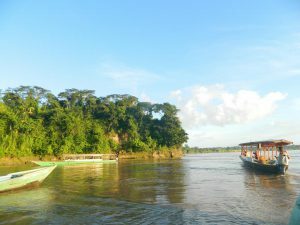 The climate is tropical and humid, typical of Amazonia. The city is an important relay at the intersection of 2 rivers on the ” Inter-ocean” Linking the Pacific to the Atlantic coast. The main economic activities of Puerto Maldonado are gold, the harvesting of Brazil nuts, ship building and eco-tourism. A shuttle links the two shores in calm waters and also links to Cuzco. In 2010 the longest bridge in South America was built to cross the river thus connecting to the Brazilian border.